The Vienna U-Bahn (German: U-Bahn Wien), where U-Bahn is an abbreviation of the German term Untergrundbahn (English: underground railway), is one of the two rapid transit (metro) systems for Vienna, Austria. The second system is the Vienna S-Bahn. With the October 2013 opening of the 4.2 kilometers (2.6 mi), three-station extension of the U2 line, the five-line U-Bahn network consists of 78.5 kilometers (48.8 mi) of route, serving 98 stations. It is the backbone of one of the best performing public transport systems worldwide according to UITP (International Association of Public Transport) in June 2009. More than 1.3 million passengers rode the Vienna U-Bahn every day in 2009, and 567.6 million passengers used the U-Bahn in 2011, which declined to 428.8 million passengers in 2013. The network is undergoing expansion and rolling stock renewal. Since 1969, 200 million euros have been invested annually in the extension of the Vienna U-Bahn. Planning for an underground railway can be traced back to the 1840s. Since then, there have been numerous plans and concessions to build such a project, making Vienna the city with the most subway planning. The concession request of the engineer Heinrich Sichrowsky dates from 1844 with the idea of an atmospheric railway based on the system of Medhurst and Clegg. The trains would have been advanced by means of air pumps stationarily stationary steam engines in a pneumatic manner. Sichrowskys route should lead from the Lobkowitzplatz below the Vienna Glacis on to the Wien River to Hütteldorf. Although such trains had been built in London and Paris, found in Vienna no investors for its stock company, so this idea was rejected. The connecting railway project of Julius Pollak (1849) was also conceived as an atmospheric system. Sichrowsky's request was the starting point for a series of plans that, however, were mostly not approved and could not be implemented. For example, in 1858 the city planner Ludwig Zettl proposed to make an overburden of the former moat instead of filling it, and then to set up a railroad tram in this enclosed ditch, which would bypass the city. This would have created a connection between the central station and the market halls, while at the same time the gas-lit tunnels were to serve as warehouses for food. By 1873, at least 25 planning for a municipal railway traffic came on, only the Verbindungsbahn, which already appeared in the much larger overall plan by Carl Ritter von Ghega in his project for Vienna's urban expansion of 1858, was later implemented as part of the mainline railway line. Incidentally, Ghega had already worked out a belt railway project along the line wall in 1845. The first planning for a subway in deep-seated tunnels by Emil Winkler dates back to 1873, in which it is also remarkable that the planning proposals were also based on the first systematic traffic census in Vienna. Another wave of public transport projects developed in the sign of the completion of the ring road. Apparently, the conception of the British engineers James Bunton and Joseph Fogerty convinced, since this was approved in 1881; This was already the 30th planning ever. The route should lead in each case partly as elevated train, laid in the tunnel underground and in the open incision. In 1883, the project of an "electric secondary railway" of the company Siemens & Halske provided a small profile rail with three lines. The construction failed due to the concern of the city council, the inner city business life could be affected, especially since the project for the first time ever included a tunneling of the city center. The first system to be constructed was a four-line Stadtbahn railway network (which had been planned to have three main and three local lines) using steam trains. Ground was broken in 1892, and the system was opened in stages between 11 May 1898 and 6 August 1901. At Hütteldorf, the Stadtbahn connected to railway service to the west, and at Heiligenstadt, to railway service on the Franz Josef Line, which then ran eastwards within the Austro-Hungarian Empire to Eger. Some of the Jugendstil stations for this system designed by Otto Wagner are still in use. However, the Stadtbahn proved inadequate for mass transport, less successful than the tramway. Starting in 1910, plans were considered for an underground system, but were interrupted by the First World War, which also necessitated closing the Stadtbahn to civilian use. After the war, the economic situation of a smaller and poorer country ruled out continuing with the plan. However, starting on 26 May 1924 the Stadtbahn was electrified, something that many had called for before the war, and from autumn 1925 it was integrated with the tramway rather than the railways. The frequency of trains tripled. Plans for a U-Bahn dating to 1912–14 were revived and discussions took place in 1929, but the Great Depression again necessitated abandoning planning. Both in 1937 and after the Anschluß, when Vienna became the largest city by surface area in the Third Reich, ambitious plans for a U-Bahn, and a new central railway station, were discussed. Test tunnelling took place, but these plans, too, had to be shelved when the Second World War broke out. Severe war damage caused the Stadtbahn system to be suspended in some areas until 27 May 1945. The redevelopment of stations took until the 1950s. Meanwhile, Vienna was occupied by the four allied powers until 1955, and in 1946 had returned three quarters of the pre-war expanded Greater Vienna to the state of Lower Austria. Two proposals for U-Bahn systems were nonetheless presented, in 1953 and 1954. Increasing car traffic led to cutbacks in the S-Bahn network that were partially made up for by buses. The U-Bahn issue was also politicised: in the 1954 and 1959 city council elections, the conservative Austrian People's Party championed construction of a U-Bahn, but the more powerful Social Democratic Party of Austria campaigned for putting housing first. The city council repeatedly rejected the U-Bahn idea in the late 1950s and early 1960s. Extensions of the Stadtbahn system had always been discussed as an alternative to building a new U-Bahn. But it was not until the late 1960s, when the Stadtbahn and the Schnellbahn were no longer able to adequately serve the ever-increasing public traffic, that the decision to build a new network was taken. On 26 January 1968, the city council voted to begin construction of a 30 km basic network (Grundnetz). 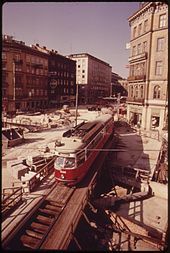 Construction began on 3 November 1969 on and under Karlsplatz, where three lines of the basic network were to meet, and where central control of the U-Bahn was located. Test operation began on 8 May 1976 on line U4, and the first newly constructed (underground) stretch of line opened on 25 February 1978 (five stations on U1 between Reumannplatz and Karlsplatz). Construction began on 3 November 1969. On 25 February 1978, the first Vienna U-Bahn route between Karlsplatz and Reumannplatz, the U1, went into operation. With twelve partial commissionings, the Vienna U-Bahn basic network was completed on 3 September 1982. In the planning of the Vienna subway network in the years 1966 to 1973, the line numbers were awarded. The designation U5 was used in this phase but again and again for lines that proved after detailed examination as not practical and therefore postponed. In early expansion variants, the U5 between Meidling Hauptstraße and St. Marx should run on the already partially sub-tunnelled southern belt route. It later referred to the current branch of the line U2 from Schottenring to the stadium as U5, whose planning a course in a westerly direction over Schottentor out in the direction Hernals provided. As of 2018[update], there is no U5 line; today's U2 line consists of parts of the previously planned U2 and U5, which are connected by an arc between the stations Rathaus and Schottentor (this was originally planned only as an operating track and is still the narrowest curve in the Vienna U train network). The designation U3 was a long time a gap in the network, but there was already in the construction of the basic network preliminary work. Thus, the entire tunnel tube of the U3 between Naglergasse / Graben and Stubentor was completed already with the construction of the U1 (Stephansplatz), in order to avoid further excavation work in the area of the cathedral. Since 2003, several plans and internal working papers of Vienna have again been planning long-term plans for a U5 line, but only in early 2014 did they again make concrete efforts to actually realize the line. Finally, in March 2014, it was announced that the U5 line would be constructed in several stages of development as part of a U2 / U5 line cross. Coming from Karlsplatz, the new line will take over the existing section of the U2 and from the station Rathaus, drive through a new section to be built. In the first expansion step, however, the line will be run until 2023, for the time being, only up to one stop on Frankhplatz in the area of the old AKH. The further construction in the 17th district is planned; However, the construction costs must first be negotiated with the federal government. (See: Fifth stage of the subway network). In return, the U2 from the city hall on the U3 station Neubaugasse and the U4 station Pilgramgasse to Matzleinsdorfer place will be performed. The financial resources for the construction come from the equally planned, but currently not prioritized and accordingly later built, southern extension of the existing U2. In this way, the already approved cost assumptions by the federal government should not expire. In some designs also a line U7 was provided, which should connect the Floridsdorf and Donaustadt districts Floridsdorf station, Kagran and Aspern east of the Danube running. However, due to insufficient urbanization, this project was not found to be meaningful and was never planned, as it would be possible to transport almost the same number of people by means of a - much cheaper - tram line, which is the replacement of tram line 26 east of Wagramer Straße, from there to the Ziegelhofstraße six stops further on its own track body, by the Gewerbepark Stadlau to the subway station Hausfeldstraße on the northern edge of Aspern was also reached. The second phase involved the expansion of the U3 and U6 lines (about 61 km (37.9 mi)). The groundbreaking ceremony for this phase took place on 7 September 1983 on Pottendsdorfer Street at the Philadelphia Bridge and after six years, the central section of the U6 between Philadelphia Bridge and Heligenstadt/Friedensbrücke went into operation. 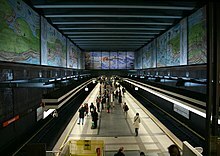 After completion of the basic network, the Vienna subway system was extended in 1989 to the line U6 with the route Heiligenstadt-Philadelphiabrücke (10.6 kilometers). For the belt line, the last remaining line of the light rail, had been modernized and converted to legal traffic. In order to preserve the valuable building fabric, the line was not rebuilt for operation with the underground railcars of the other lines; tram or metro-like trains with overhead power lines were used. Northern line endpoint was now only Heiligenstadt; the alternative northern terminus of the last light rail line, Friedensbrücke (U4), was not approached. 1995 followed the first extension of this line in the south: from Philadelphiabrücke (now station Meidling) to Siebenhirten including the elevated railway line of the former express tram line 64 over a length of 5.2 km. In 1996, the U6 was extended in the north to Floridsdorf and the previous terminus Heiligenstadt (U4) is no longer approached. The two remaining, abandoned links of the former light rail are like much of the U6 listed building and are now partly used as a bike path. In 1991, the completely newly built line U3 between Erdberg and Volkstheater was opened, which crosses the first district after the U1 as a second line. The western terminus Ottakring was reached in 1998, the southeastern end of the U3 is since the year 2000 in the station Simmering. The total length of the network increased with these construction measures of the second stage to 61 kilometers. On 19 October 2001, the groundbreaking ceremony for the extension of U1 was held, for which the two districts had been waiting for 20 years. After five years of construction, the 4.6 km (2.9 mi) long extension of the U1 was opened on 2 September 2006. On 12 June 2003, the groundbreaking ceremony took place outside the Stadion (stadium). Because of the 2008 European Football Championships in Austria, there was enormous pressure to complete the construction on time. The Wiener Linien met the deadline, and on 10 May 2008 the U2 extension to the stadium was opened. On 2 October 2010, a further six stations were opened taking the U2 across the Danube via Donaustadtbrücke to Aspernstrasse in the twenty-second district (Donaustadt). An additional 4.2 kilometers (2.6 mi), three station extension of the U2 to Aspern Seestadt was officially opened on 5 October 2013. In March 2012, it was officially announced that the southern branch of U1 would instead be extended to Oberlaa and not the originally planned Rothneusiedl. This was achieved by expanding the pre-existing route of tramline 67. The change to the original plans was thought to be due cost issues or the incomplete development of the area surrounding Rothneusiedl. This extension was ultimately opened to the public on September 2, 2017, thereby expanding the Vienna metro network by 4.6 kilometres and 5 stations. In the area of the station Alaudagasse preparations for a future line bifurcation were made, should the further development in Rothneusiedl warrant a branch line there. The originally planned southern extension of U2 to the Gudrun road was indefinitely delayed, since the originally assumed need is no longer present. With the budgeted funds, the so-called line cross U2 / U5 will be created instead. The line U2 coming from Seestadt and Schottentor will receive a new south branch, leading to the S-Bahn station Matzleinsdorfer Platz. The remaining route of the U2 between Karlsplatz and Universitätsstraße will be taken over by a newly created U5 line, which will be supplemented by the station Frankhplatz (Altes AKH) for the time being. This line should also lead a fully automatic operation, as currently used at the Nuremberg U-Bahn. Start of construction for the resulting crossroads is scheduled for 2018, 2024 (U5), and 2026 (U2) respectively. With the opening in October 2013 of the 4.2-kilometer (2.6 mi), three-station extension of the U2 line, the U-Bahn consists of 78.5 kilometers (48.8 mi) of route. With the U2 extension, the five U-Bahn lines (U1-U4 and U6) now serve 98 stations, including nine interchanges. Further extensions of the Vienna U-Bahn are scheduled to be completed by 2019. Upon completion, there will then be a network that is 90 kilometers (56 mi) long with 116 stations. Some plans have been proposed for the system beyond 2019, although such plans are currently unfunded. U-Bahn services run between 05:00 and around 01:00 at intervals between two and five minutes during the day and up to eight after 20:00. 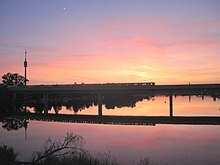 Since 4 September 2010, there has been a 24-hour service operating at a 15-minute interval in the nights between Fridays–Saturdays, Saturdays–Sundays, and in the nights prior to a public holiday. The 24-hour U-Bahn is supplemented in these nights by Vienna NightLine bus services. The fifth expansion phase will involve dividing the existing U2 line at Rathaus Station into two lines and then extending each of them. The section of the U2 line from Rathaus to Karlsplatz will be upgraded for driverless operation and become part of the new U5 line, which will extend from Rathaus to Elterleinplatz via an interchange with the U6 at Michelbeuern AKH. The rump U2 line will be extended from Rathaus to Wienerberg via interchanges with the U3 at Neubaugasse and the U4 at Pilgramgasse. The U5 line will be Vienna's first driverless U-Bahn line. Construction on the new line will start later in 2018. Entry into service is planned for 2024. The Vienna U-Bahn has three types of rolling stock, and has maintenance of way equipment. The U1, U2, U3, and U4 have two types of rolling stock: the older U/U1/U2 type (introduced in 1972) and the newer V type (introduced in 2002). The U6 has one class of train, the T/T1 type (introduced in 1993), the older E6/C6 having been retired in 2008 and which now mostly operate in Utrecht in the Netherlands and Kraków in Poland, with a single set being preserved at the Vienna Streetcar Museum. The first cars of the type U, developed by Simmering-Graz-Pauker (SGP) were delivered in 1972. The smallest unit is a two-axle motorcars, 36.8 metres long and 2.8 metres wide, permanently coupled twin railcar. A train is made up of three double cars. By 2008, short-haul trains with two double-wagons were used during downtimes or on the U2 line. Technically, the cars are very similar to the Munich and Nuremberg subway trains. However, there are significant differences in the award-winning car design. By 1982, a total of 135 double railcars Type U were delivered, but are now retired. From 1987 SGP supplied with the type U1 (later referred to as U11), a second generation, which looks like its predecessor outwardly. The technical equipment has been further developed and includes water-cooled three-phase motors, brakes with energy recovery and modernized emergency braking and safety equipment. In the years 2000 to 2010 trains of the later type series of the type U were rebuilt and equipped with new three-phase motors, which should extend their life for another 20 years. The converted trains are called Type U2. These vehicles operate on the lines U2 and U3. The interior of a car consists of eight pairs of vis-à-vis seats in the middle section, nine seats on the driverless ends and two pairs of seats opposite each other in the opposite end of the car. In 2006, the U1 and U2 LED displays replaced the original in-and-out illuminated telltale displays. In addition, the trains will gradually be retrofitted with plastic seats, video surveillance and warning lights to signal the door closing operation. At Type U, no such conversions are made because the vehicles are successively scanned. An individual railcar has 49 seats and 91 standing places. In a train consisting of three double railcars, this is 294 seats and 546 standing places. The maximum speed is 80 km / h. The design of the "Silver Arrows" trimmings comes from the railway designer Johann Benda. In the late 1990s, a consortium of companies Siemens, ELIN and Adtranz developed a new train called Type V or "V-Car". It is a continuous, permanently coupled six-car train consisting of two non-motorized control cars and four motorized intermediate cars. This corresponds to the length of three double wagons of the Ux type family. After a prototype had been mostly used on the line U3 from December 2000, 25 sets were purchased in June 2002 and again 15 trains of this type in December 2007. Of these, the first sets were delivered from February 2005, which received their operating license in mid-August 2006 after several delays. At the end of September 2009, another 20 vehicles were ordered. In contrast to the prototype, the production cars in the interior were adapted to the new standard and got gray instead of white sidewalls and red plastic seats instead of the originally installed fabric seats. The newer Type V lines also feature yellow instead of gray-red handrails, improved interior displays and warning lights to signal the door closing operation. A car consists of eight pairs of Vis-à-vis seats in the middle section and six seats each at the car transitions. At the beginning and end of the trains there are multipurpose compartments with four folding seats each and automatically extending ramps at each station to close the platform gap. They are the first Vienna subway cars to have air conditioning and are factory-equipped with video surveillance. In order to keep the station stays short and avoid blocking by passengers, the doors have only sensitive sensor edges as anti-trap instead of light barriers. An individually opened door therefore only closes again as part of a central closing operation. All entrances can also be opened centrally from the driver's seat. The trains were equipped with extensive safety technology, such as fire detectors in the roof areas, temperature sensors and dry extinguishing pipes on the undercarriage. Smoke or temperature exceedances are immediately transmitted to the driver. The type V cars have 260 seats and 618 standing places. Their top speed is 80 km / h. The exterior design is the responsibility of Porsche Design. The Line U6 plans to have trains of the series U, also with regard to the monumental protection, and the construction costs, would mean a heavy intervention in the existing urban railway line, one left it in the enterprise with overhead line, tram-like cars and optical signals (no LZB). Since 1993 Bombardier Wien has been developing 2.65 meter wide, double-articulated low-floor vehicles of the type T, which are similarly deployed as Type 400 on the Lokalbahn Wien-Baden and serve as the basis for the successful vehicle family Flexity Swift are. A set consists of three permanently coupled cars, a train of four sets. By 2008, short-cut trains from three sets also operated during off-peak hours. The T-cars drove initially in conjunction with the older E6 / c6 cars, so that each train was a low-floor car, today only trains made entirely from T- and T1-cars. Seats: 232, standing room: 544. A video-monitored, equipped with air conditioning, electronic interior and exterior displays and new design further development of the Type T comes since May 2008 as Type T1 used and replaced the old E6 / c6 high-floor suits. Since December 24, 2008 only vehicles type T and T1 on the U6. The T and T1 cars can be coupled with each other so that trains from T and T1 cars can run mixed. At the end of 2009, the T-cars began to be equipped with electronic indoor and outdoor displays and to improve the safety of passengers, personnel and against vandalism with a video surveillance of the interiors and thus visually align the T1. Also, the older cloth seats in the T-wagons are gradually being replaced by new, red plastic seats with yellow handles, which can also be found in the T1 car and in the Type V metro car. The vehicles of the Tx type family will also receive successive warning lights for signaling the door closing operation. So that they can be transferred via the tram network to the main workshop of Wiener Linien, the T and T1 cars are equipped for tram operation. From the light rail operation, the 2.3 meter wide, six-axle articulated wagons type E6 (railcar) and c6 (sidecar) "type Mannheim" were taken over, which were built in 1979 by Lohner and Rotax in Duewag license. An entire train offered 192 seats and 432 standing places. Until the end of 2008, the trains still operated in conjunction with T-cars, ie E6 + c6 + T + c6 + E6. In May 2008, the delivery of the type T1 began, which should completely replace the type E6 / c6. On December 23, 2008 drove for the last time E6 / c6 cars on the U6. Most of the vehicles were sold to Utrecht or Krakow. A train consisting of a railcar and a sidecar is obtained in the Museum of Remise. The E6 and c6 in Utrecht were sold to Krakow in 2014. Aspern Nord: Aspern Affairs, two big artistic maps of Vienna at the end of the platform, one of 1809, where Napoleon has lived and one of 1912, where the airport in Aspern (at the time the biggest airport in Europe) had seen. Also there are colored "livelines" above the tracks that shoe the names of famous people, and their birth and death dates. The art was created by Stephan Huber. Also, the main entrance of the station has a big flight roof. ^ a b c "Wiener Linien – U-Bahn 2001 bis 2014" [Vienna Transport - Subway 2001 to 2014] (in German). Wiener Linien. April 2015. Retrieved 17 February 2016. ^ a b c d e f g h i j Hödl, J: Das Wiener U-Bahn-Netz, Wiener Linien, 2009. ^ a b c d "Happy Birthday! 45 Jahre Wiener U-Bahn" [Happy Birthday! 45 Years of the Vienna U-Bahn] (in German). Wiener Linien. November 2014. Retrieved 6 January 2016. ^ a b c d e f g "2014 Zahlen, Daten, Fakten - Unternehmen" [Company Profile - Figures, Data, Facts] (pdf) (in German). Wiener Linien. April 2015. pp. 3–4. Retrieved 3 July 2015. ^ a b c "Unternehmensprofil - Zahlen, Daten, Fakten" [Company Profile - Figures, Data, Facts] (in German). Wiener Linien. 2015. Retrieved 3 July 2015. ^ a b c "U2 auf verlängerter Strecke unterwegs" [U2 Route Extended] (in German). Wiener Linien. 6 October 2013. Retrieved 5 April 2014. ^ a b c "U2-Verlängerung eröffnet" [U2 extension opened] (in German). ORF Wien. 5 October 2013. Retrieved 9 March 2014. ^ "Alles über uns: Betriebsangaben 2011" (PDF) (in German). Wiener Linien. 2012. Archived from the original (PDF) on 11 January 2014. Retrieved 11 January 2014. ^ "Stadt fixiert Trassen von U2 und U5" (in German). ORF Wien. Retrieved 2 August 2014. ^ "U-Bahn-Bau feiert 40. Geburtstag" (in German). ORF Wien. Retrieved 31 May 2010. ^ "Wiener Linien opens U2 extension". Railway Gazette International. 16 October 2010. Retrieved 9 October 2013. ^ "Wien metro line U1 to be extended to Oberlaa". Railway Gazette International. Retrieved 3 April 2012. ^ "Linien U2 und U5" [Lines U2 and U5] (in German). Wiener Linien. 2015. Retrieved 9 November 2015. ^ "Vienna to Introduce Driverless U-bahn Trains". International Railway Journal. 23 June 2015. Retrieved 9 November 2015. ^ "Linienkreuz U2/U5 steht in den Startlöchern: Erste Bauarbeiten 2018" [U2/U5 Line Crossing is on the Starting Blocks: First Construction in 2018] (in German). Vienna.at. 30 November 2017. Retrieved 17 April 2018. Wikimedia Commons has media related to Vienna U-Bahn. This page was last edited on 13 April 2019, at 16:13 (UTC).